Even more fantastic features and options to customize your WordPress/WooCommerce site. 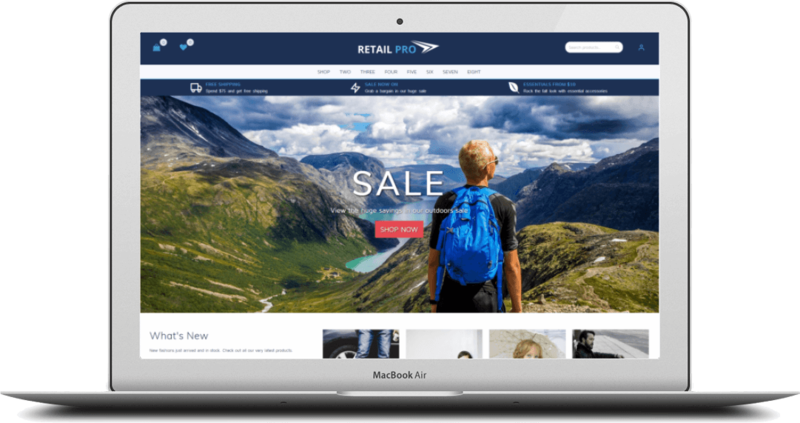 If you like our free Retail Theme, you’ll love Retail Pro. Extra homepage sections options, including section title, description, layout, columns, number of items. Extra homepage widgetized area for categorized products with the ablility to add an unlimited number of widgets. Additional widgets for slider/hero images, categorized products and USP (Unique Selling Points) information with icon/image selector. Extra footer column widget areas with 16 different layout options. Replace “Powered by WordPress…” with your own text/content. 20 extra shop options including products grid/list view, removal of product sorting options and more. Over 600 Google fonts to choose from. More than 80 typography options, including font size and weight selectors. Upgrade and get Retail Pro to keep and use forever.